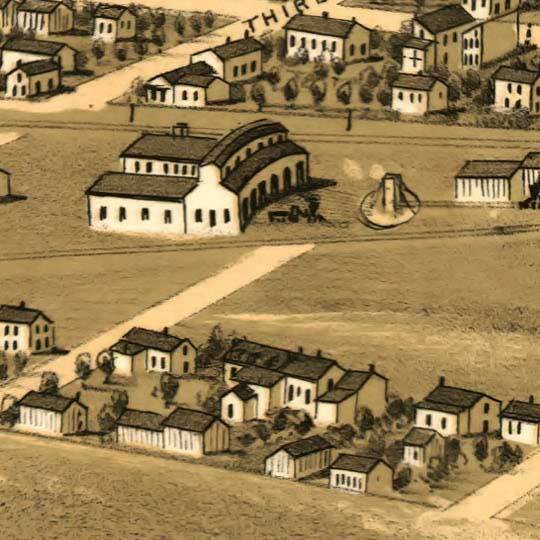 A. Ruger's Birdseye map of Franklin, Missouri in 1869. This map isn't part of any series, but we have other Missouri maps that you might want to check out. 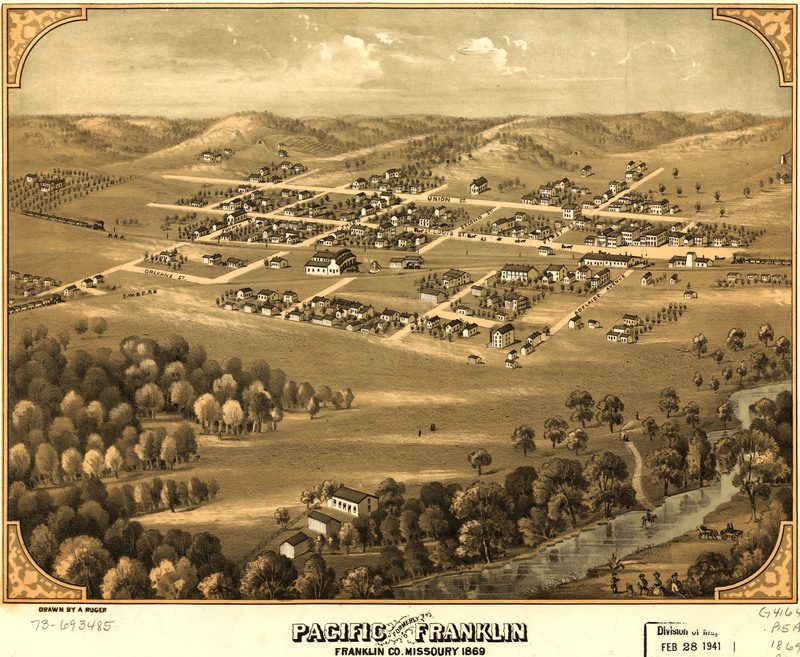 This birdseye map of Pacific, Missouri [gmap] is by-the-book early Ruger; handsome and solid. Some random notes: 1. )the alternate spelling, ”Missoury” had to have been stylistic and intentional, yes? and 2.) I'm no marketing whiz, but if you keep going around saying ”XXXXX” (formerly “YYYYY”) doesn't that just ensure that nobody fully commits to “XXXXX”? C'mon, Pacific... just rip it off like a band-aid. Pacific is also host to a high-school wrestling tournament; and I'd be personally very shocked if the folks there are not still talking about that one belly-to-back suplay thrown by a young 135-pounder in the early 1990s to keep his opponent in-bounds. I mean, sure, it was in the consolation bracket, but the amplitude was staggering. My relatives were in Franklin in 1868, and that is the last I can find them. Some of the kids went to Texas by 1872, some were in Arkansas, but we have no idea what happened to the parents: John and Elizabeth Henson Brandon. Last seen in county tax records in 1868 Franklin Co. I love this map, and as I have never been there, it was wonderful to see something near to what it must have looked like to them. Great stuff! Thanks! Beautiful map work.